This is cool stuff! I visited Chiang Mai last week and took a walk along the walking street from Tha Pae gate toward Wat Pra Sing. I had a really good sense of hope, of course, not about buying stuff but something that I really admired – citizen action! At Wat Pan Oan (วัดพันอ้น) one of several buddhist temples along the street crowded by hundred of food stalls where people stopped over and had something to eat. Here no styrofoam allow! Big sign hanging from the tree read “no foam for for food project” (sponsor by one businessman who want to encourage market for green products – I don’t remember his name). There is waste segregation station where young volunteer standing to help people to put their own food waste into the right slot. Food waste including leftover liquid drink will be put on one big bin. This is very important as people seem to both enjoying eating and shopping. This is cool stuff! Small steps that will finally influence the big systems to which we are connected. Help cutting consumption of unsustainable products like “styrofoam” is a good start to help transform the wider waste management system in the country. 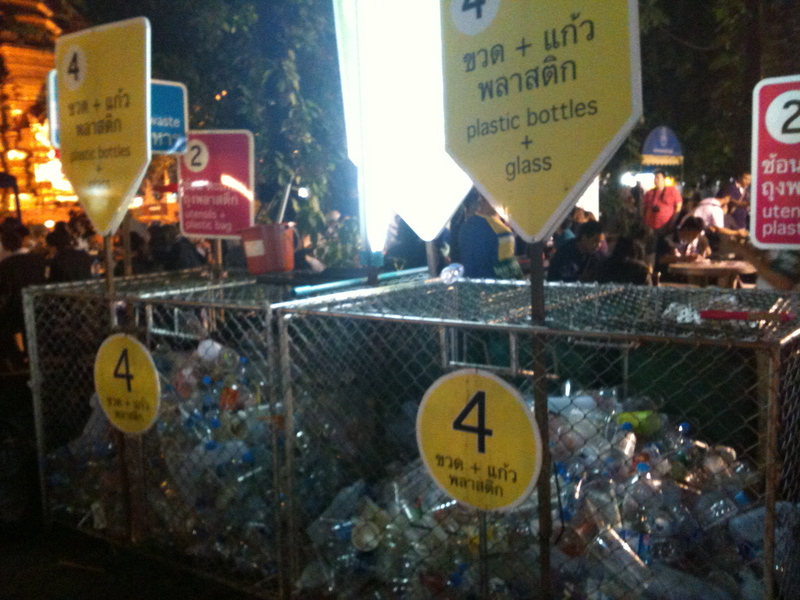 If you have chance to walk, shop, and eat along Chiang Mai’s walking street you can do your own bit – help the guy at waste separation station at Wat Pan Oan and enjoy it. Every time you design a bit of our lives to reduce your impact, support good efforts and make your lives more comfortable, beautiful, and exciting, you are sending a powerful message to everyone around you. what about in our office?